The 9th International Conference on Building Resilience will be held in Indonesia, which is widely recognised as one of the world's most natural disaster-prone areas and is at risk to multiple hazards, including flooding, earthquakes, landslides, tsunami, volcano, and cyclone. Over the last 30 years, there have been an average of 289 significant natural disasters per year and an average annual death toll of approximately 8,000. Like many other countries, climate change is also recognised as a key threat to Indonesia's development, especially for lower-income groups. Rising sea levels and changing weather patterns may lead to increased uncertainty in water availability, food production, and disruptions to transport, commerce, and urban development. According to the GFDRR, the Government of Indonesia spends $300 to $500 million annually on post-disaster reconstruction. Costs during major disaster years reach 0.3 percent of national GDP and as high as 45 percent of GDP at the provincial level. The growing losses from disasters in Indonesia and many other countries around the world are not sustainable and will severely hinder society's ability to address wider development goals. Effective reduction of losses and risks from natural and human induced hazards, and climate extremes, requires integrated actions at different levels of governance. One of the greatest challenges faced by governments is in creating institutional convergence that integrates global goals emanating from the Sustainable Development Goals (SDGs), the Sendai Framework for Disaster Risk Reduction (SFDRR), the Paris Agreement on Climate Change (PACC) and the World Humanitarian Summit. Disaster risk reduction (DRR) and climate change adaptation (CCA) are part of key agendas being considered in all these recent global agreements. The 9th International Conference on Building Resilience, with the theme 'Investing in Disaster Risk Reduction and Climate Change Adaptation for Building Resilient Cities', will bring together the full diversity of the science community, policy makers, practitioners and researchers from all geographical regions, at local, national, regional and international levels to share state of the art research, and discuss how the science community will best support convergence that integrates global goals emanating from the 2030 development agendas. Disaster risk reduction (DRR) and climate change adaptation (CCA) are issues that cut across different sectors, which requires trans-disciplinary and trans-boundary approaches with the support of the natural and social sciences, including for natural hazards and applied fields such as health, agriculture, economics, environment, engineering and technology. Science can and should play an important role in reducing risk and building the resilience of nations and communities to disasters. The conference will culminate in the development of a briefing paper that identifies approaches that could help achieve better synergies in implementation of these frameworks on the ground via programmatic integration, collaboration, capacity, and innovation. 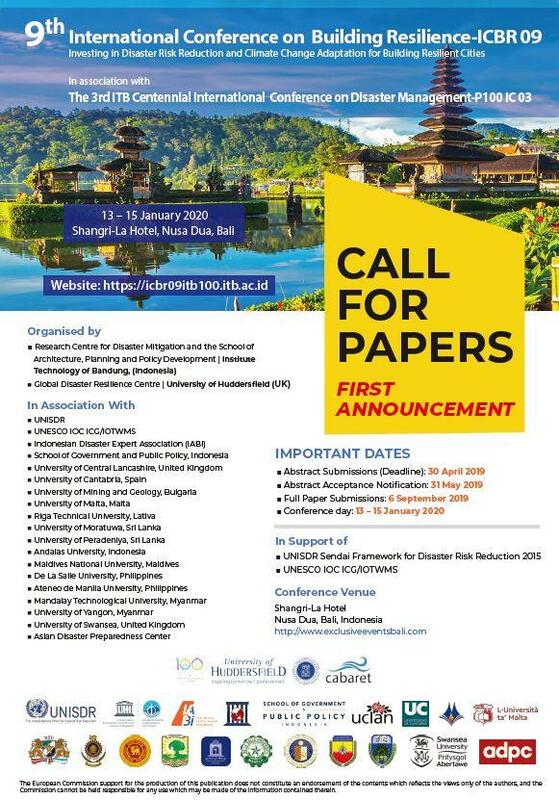 The Conference will be held as part of the "Towards First Centennial of Technical Higher Education in Indonesia (PTTI) - Institut Teknologi Bandung (ITB) commemoration". ITB as a centre of excellence for science, technology and art in Indonesia, will conduct a series of activities for 2017-2020 which include International Conferences, National Seminars, Panel Discussions, Talkshows, Exhibitions, and many others which comply to the theme of commemoration: to encourage and support advances in science, technology and art which have a beneficial impact to society. ICBR is series annual international conferences using "resilience" as an analytical framework to better understand how society can prepare for and respond to the threats posed by natural and human induced hazards. The inaugural conference, held in 2008, was held at Heritance Kandalama, Sri Lanka. The conference returned to Sri Lanka in 2011 and 2013, before moving to a range of international venues. Subsequent conferences have been held in Greater Manchester, UK (2014), Newcastle, Australia (2015), Auckland, New Zealand (2016), Bangkok, Thailand (2017) and most recently in Lisbon, Portugal (2018). These conferences brought together major international networks to address global challenges and advance research agendas. The conferences regularly attract over 300 delegates from a wide spectrum of countries, disciplines and sectors. The conference has eleven tracks that address a diverse range of challenges and approaches that can support efforts towards disaster risk reduction and climate change adaption. All submissions are managed through the EasyChair conference management system. The submission web page for ICBR 2019 is https://easychair.org/conferences/?conf=icbr2019. The system will open for submissions on Monday 25th March 2019. ­Academic Paper and Presentation - Abstract and full paper submission required, subject to double blind peer review. ­Poster Presentation - Abstract and poster submission only, non-peer review. ­Doctoral School - Abstract and full paper submission required, subject to double blind peer review. For students registered at recognised Higher Education Institutes. We look forward to receiving your submission. For more information, please visit: https://icbr09itb100.itb.ac.id.